This winter the Board of Advisors of the Charles M. Bair Family Trust approved the long-term loan from a private collector of several significant early Native American stone artifacts discovered near Two Dot, Montana, in 1958. In a story reminiscent of Huckleberry Finn’s adventures, three young Montana boys headed out in 1958 across a recently plowed field near Two Dot on the Big Elk Creek Bottom. Their plan was to complete a cottonwood raft they had been building. Instead they walked into an area about eight feet in diameter filled with stone tools, flakes and chips. 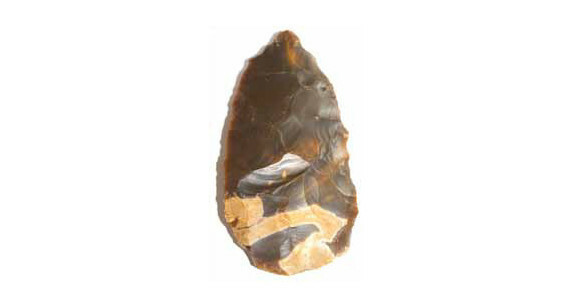 They dug down in the soil until they could not find any more, and then divided the larger stone tools, including many bifaces as large as seven inches in length, amongst themselves. In the years since their discovery, many of the objects disappeared. However, one of those boys, then twelve-year-old Loren Haarr, held on to what he could and remained passionate about studying these rare objects as well as sharing them with others. Now known as the Big Elk Creek Cache #1, these objects are projected to be Pre-Pelican Lake Culture and approximately 5,000 years old. To enhance and expand our Native American collection, Mr. Haarr has generously made a long-term loan to the Bair Museum of his artifacts.